Called the Picture Salon folks earlier today to very, very positive results. I spoke to Barbara, the lead manager there at length about billing, process, shipping and the way they do business. Was intrigued to find out they do work (the giclees that are stretched versions of works they have in their collections) for the Art Institute of Chicago for their store and catalog sales. We had a good talk about working with museums, the opportunities and demands of filling catalog orders etc. Then, thinking on my feet, I asked Barbara if she knew anything about giclees and the whole edition thing which she waxed quiet expertly on how a variety of folks identify giclees in the digital world from the omni-present and omni-rich Thomas Kincaide to "just folks" (with integrity--my bias, not hers). Fascinating. Would like to find out more before I blab on about it with you all. I have a feeling with the care and schmartz our friends at Picture Salon have about the work, I may be uploading my thesis with them (and they will keep the files should I need reprints!!). It all seems a little too easy. I am looking for the catch. We will see. Lets reconfirm: easy and smart (check), can do my sizes with ease and at a fab price(check), like illustrators and photographers= used to high picky factor (check), will store my files for later(check)-- Now all we have to see is the actual print and we are rollin'. Daffodils still coming on. Allium on the verge of popping. Lilacs still tight. Atnd the blowout we call hosta are jynormous right now even in their nascent spring state. I could split many of them 3 times over and have gigantic plants. So, perhaps a little switching around of the nursery might happen this weekend before the walnut trees bud--and the dynamic of the "no deer" beds change. Starlilngs and squirrels attacking the bird feeders. Fighting and quarreling groundhogs woke me up last night having a couples spat. They live under the front porch and from time to time reminded me who is the real tenent (I am). They have chased me down the walk with their frighteningly big nails and their skittering ways. Ugly sound to wake to. Even uglier as it switched that funny little switch that caused me to want to solve the worlds problems all by my lonesome. Its a tiresome place..to be. Damned chattering rodents! I think another dose of polluted cat litter down their stinkin' holes might remind them who is paying the bills! They are not good tenants. The picture above are of the groundhogs that fight in front of our house. No...not really, they are courtesy of Minckler at Flickr. 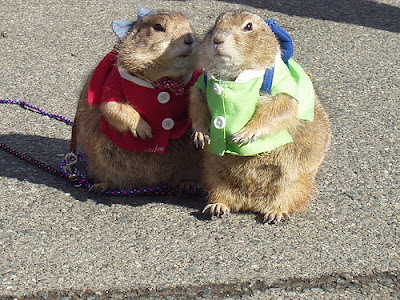 My art director mentioned that I should do a picture of the quibbling groundhogs, and in search of some reference, I found this perfect image. They are from a castle in Japan where the japanese have trained and dressed these beasts for the entertainment of their guests. Minckler poses the question about what the two of them are talking about. My guess, she is reminding him that he is wrong...just like they were last night.